Corporate reputation management services by Dr. Joel Haber help corporations respond to high-profile bullying incidents as well as implement strategies which minimize the risk of future bullying incidents. Dr. Joel Haber is a corporate reputation management expert who can aid your firm in navigating these difficulties. During a high-profile bullying incident, everyone—including executives and leaders—focus on the workplace culture. However, anti-bullying expert Dr. Haber knows that you can’t create a culture of respect, civility, and empathy overnight. Therefore, he works closely with Human Resource Officers, Diversity Officers, and Inclusion Officers to instituted bullying prevention programs within the workplace. Bullying behavior begins at an early age. When you have a bullying issue in you workplace this is a result of an early childhood behavioral pattern that has grown into adulthood. As an employer you can help stem the tide of bullying by offering to your employees, in particular those who are parents, a youth bullying program to help them better understand the signs and symptoms of youth bullying. 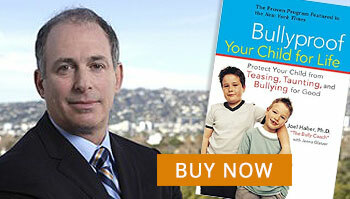 Dr. Joel Haber offers an extensive Youth Bullying programs. Click here to learn more about Dr. Haber’s preschool bullying program.